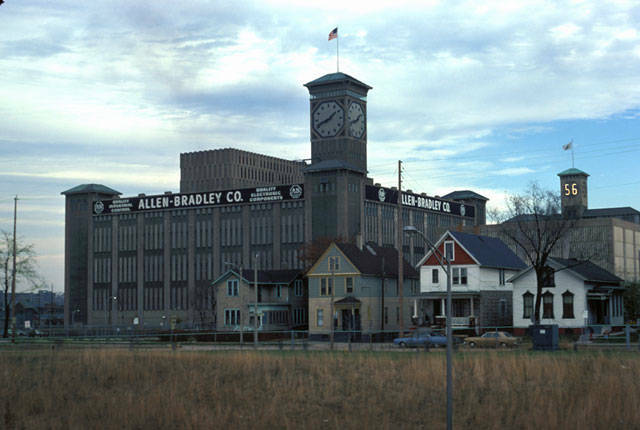 Founded by Lynde Bradley in 1903 with the financial backing of investor Dr. Stanton Allen, what became the Allen-Bradley Company has served the Milwaukee community for over one hundred years, specializing in the design and manufacturing of various electrical products. During the twentieth century Lynde and his brother Harry built the company into one of Wisconsin’s leading employers, gradually expanding their business and its production facilities in the Walker’s Point neighborhood. As major events transformed the United States, Allen-Bradley shifted product development to meet the needs of the country. During World War I, Allen-Bradley produced, among various components, control panels for Navy ships, with military orders accounting for seventy percent of the company’s business. As the Great Depression set in, the company developed small resistors for radio sets, allowing more Americans to hear President Franklin Roosevelt’s famous fireside chats. Extensive research and development in the 1930s gave Allen-Bradley the edge in securing lucrative government contracts for electrical parts in airplanes and ships. The number of employees increased from 550 in the 1930s to 1,300 during World War II, and total sales tripled from 1940 to 1945. After World War II, Allen-Bradley returned to its main business, electro-mechanical industrial controls, but continued to develop technology for other industries. The company became a leading producer of electronic components, control systems, magnetic materials, reinforced thermoplastic moldings, industrial controls, and adjustable speed drives. These technological innovations were used to manufacture machine tools, automobiles, food processing products, forest products, pulp and paper, and glass, as well as instruments for the petrochemical, aerospace, and mining industries. In 1962 the company finished renovating its headquarters, a building that featured what for decades was the largest four-faced clock in the world. In 1985, Rockwell International purchased Allen-Bradley for $1.651 billion, the largest company acquisition in Wisconsin state history. The sale boosted the financial assets of the Lynde and Harry Bradley Foundation, a local philanthropic organization that continues to promote limited, competent government, the defense of American ideas and institutions, and support for a free market economy. As the company entered the information age of the 1990s, Rockwell International developed manufacturing software and technology, most notably PowerFlex. A few years after a 2001 name change, Rockwell Automation initiated a partnership with Intel Corporation, using high-performance network processor technology in industrial automation applications. In 2007, Rockwell began its PartnerNetwork program, designed to facilitate better customer relations and interactions with a global network of like-minded companies. By the middle of twenty-first century’s second decade, Rockwell Automation employed approximately 22,000 individuals, spread across more than eighty countries. In the fiscal year 2015, it sold $6.371 billion of industrial control products. ^ Harry H. Anderson and Frederick I. Olson, Milwaukee: At the Gathering of Waters (Milwaukee: Milwaukee County Historical Society, 1981), 179. ^ John Gurda, The Making of Milwaukee (Milwaukee: Milwaukee County Historical Society, 1999), 240. ^ Gurda, The Making of Milwaukee, 240. ^ Meg Jones, World War II Milwaukee (Charleston, SC: The History Press, 2015), 62-74. ^ Jones, World War II Milwaukee, 62-74. ^ “Our History 1960s-1980s,” Rockwell Automation, accessed March 2, 2016. ^ John Gurda, The Bradley Legacy: Lynde and Harry Bradley, Their Company, and Their Foundation (Milwaukee: Lynde and Harry Bradley Foundation, 1992), 152. ^ “What We Do,” Lynde and Harry Bradley Foundation, accessed March 2, 2016. ^ “Our History 1990s-2010s,” Rockwell Automation, accessed March 2, 2016. ^ “Rockwell Automation (ROK) Q4 Earnings and Revenues Miss,” November 10, 2015, accessed March 2, 2016.